This exclusive maisonette would fit effortlessly into the above series; centrally located in the charming Jekerkwartier, right in the heart of bustling Maastricht, top exclusive finished, open living spaces, spacious outdoor space, enough bedrooms for friends, family or acquaintances and all city facilities within easy reach. Here you can live as it is meant in the center of an international city! The trendy upstairs apartment is fully equipped; the ground floor gives access to a spacious basement and separate bicycle storage. A playful entrance, with spacious landing, accompanies us to the first floor where fully transparent function is given to living, cooking and enjoying the outdoors. The robust wooden floor, open gas fire and visible mismatches in combination with the sleek white design kitchen, give the whole a chic, but tough character. The large roof terrace of approximately 36m² invites you to long tables in the evening sun. The second floor has three bedrooms, the master bedroom with a luxurious open bathroom and connecting walk-in closet. Of the 2 spacious bedrooms on the third floor, there is one with an integrated shower and sink. This city house is also excellent with a family to inhabit. A car, which actually gets an unnecessary function here, is to park around the corner in a closed private parking garage. Our Lady's tennis team with 10 women stayed in this wonderful house for one weekend in September. The house is very spacious and it was no problem to stay there with 10 persons. The most wonderful place is the large living room with its fireplace and open kitchen! The Location of the house is perfect: the center of Maastricht, a lot of restaurant and shops are all nearby. Parking your car is easy: you can use the private garage or the public parking garage around the corner. Yanneke was very nice and helpful! Thank you very much for this perfect stay! Especially if you're here for the Ironman Netherlands event! House owner, Bea and host, Janneke were so friendly and kind and very helpful on site. Even cheered me on out on the run course (which runs RIGHT by the house). This house is huge, btw!! Lots of space for big family or many friends. Be prepared for spiraling staircase to all 3 floors as it is a vertical style layout but worth every step (even if I had just finished an Ironman). Comfortable otherwise, especially the beds! Large fully equipped kitchen. Very conveniently located to tour the area or to get to event site. So many restaurants and shops nearby. Our only "grrr" to our whole stay was the attack of the mosquitoes the first night. Leaving the windows open for cool air was a very bad idea. Bring a mosquito net or close the windows! I say BOOK, you won't be disappointed!! I'll be brief and to the point: the apartment is in an excellent location in the center of Maastricht. Everything one would want to see (or may need to access) is within easy walking distance. Yet at the same time it is not located in a very busy part of town; best of both worlds, really. The street has a number of very interesting shops that range from a violin maker's workshop to modern design studios (a much more eclectic selection than the rather conventionally commercial center of Maastricht). Also within a 1-2 block radius from the apartment are several very good restaurants, cafes, bars, bakeries, delicatessens, etc. The apartment itself is well equipped, very spacious and furnished comfortably & tastefully. Everything was spotless throughout. The floor plan is among the strangest I've encountered, but it adds a lot of character and is definitely part of the experience. The living space is distributed across 4 tall stories, accessed by steep, winding staircases. Fun at first, but it can turn into quite a workout after a few climbs! Bottom line is that we would return here in a heartbeat, no question about it. A special mention for Janneke, who showed us around the property at check-in: our arrival was delayed by many hours due to unforeseen closures of train tracks along our journey. Janneke kept in contact throughout our ordeal, providing us with valuable information that made our trip easier. She also came to pick us up at the Maastricht train station on her own initiative (late on a Saturday night, nonetheless). And to top it all off, she filled the fridge with groceries for our breakfast, since stores would not open the next day until noon. We cannot thank her enough! My husband and I stayed in Bea's wonderful apartment for 8 nights while we visited our daughter who is doing a semester abroad at University of Maastricht. Bea is super helpful and will assure that your rental goes smoothly. The apartment itself is decorated in a perfect mix of very old and ultra modern that reflects the character of Maastricht itself. We really appreciated the gas fireplace in the living room, the small deck for lounging in the afternoon sun, the beautiful en-suite in the master bedroom and the ability to wash some clothes during our stay. We couldn't imagine a more perfect location for our stay in Maastricht. You are a very short walk from Vrijthof Square, Stadhuis Markt and the river promenade. Cafes and trendy shops are everywhere and the city's vibe is very laid back, fun loving and friendly. Buy amazing breads and cheeses at the shop on one side of your flat and delicious olives and spreads at the shop on the other side. Relax at the cafes and soak in a culture that refuses to rush or to be stressed. If you are renting a car as we did for a few days, Bea has a parking space available for a small daily fee in a garage just around the corner. Maastricht itself is best explored by foot or bike but the countryside of Limburg is stunning and there are many great day trips to be made if you have a car. Bea, thanks again for a perfect stay. We hope to return to beautiful Maastricht again someday and if we do, we know without a doubt that we'll want to stay at your apartment, surely the best rental in the city! 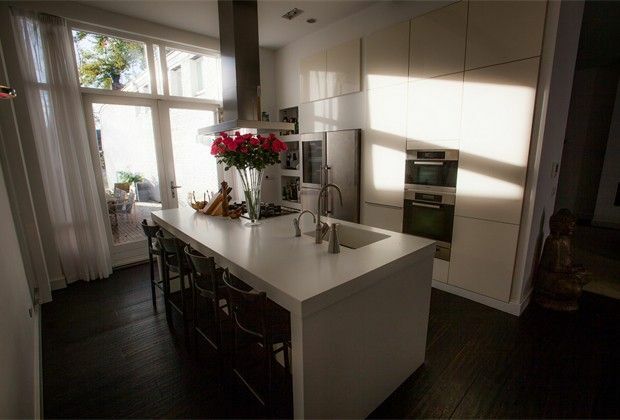 This city apartment is located in the Jekerkwartier in the center of Maastricht. The center is very compact and organized. Large areas are pedestrianized and most sights are within walking distance. St. Servaas bridge links the old center with the trendy Wyck. And from the adjacent Ceramique you through the 'Hoeg Brögk' and the city park as back in the center. Because you can stroll through charming streets without getting lost, you feel in Maastricht always at ease. Jekerkwartier is a vibrant area, which is surrounded by the city park and the old city. Inside is the university. Thread in this district is the river Jeker, both below and above ground, through the neighborhood. The atmosphere is welcoming and traditional; the creative arts, as a meeting place for artists and students and also accommodates many galleries and art shops. Cozy Cafes and terraces are in the Jekerkwartier abound. One big difference is that here you will find the real people of Maastricht who avoid the bustle of the tourist and terraces to enjoy the authentic atmosphere of the Jekerkwartier. Art galleries, art studios, design studios and even home studios you will encounter during a stroll through the narrow streets of the Jekerkwartier. The various gallery owners and artists offer various paintings, sculptures, art glass in all sizes, designs and price ranges to. You will find a huge variety of art styles; Modern art, Pop Art, Classicism, 17 and 18 century art, Oriental art, and Tribal Peoples Art, in short something for everyone. Continuous are indoor and outdoor exhibitions organized by both national and international artists which many art lovers regularly visit this artistic quarter of the city.